Today is our anniversary! Even though it has only been six years, we have been able to do so much together, never with a dull moment! 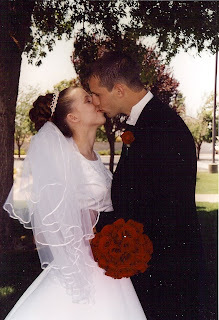 We were sealed in the Mesa Arizona Temple on November 13, 2004, and enjoyed married life for 4 years before having children. Then, we were blessed with our first son, Talan, and soon we will be blessed with a second child! We were talking the other day and wondered, "What did we do before kids?" Well, we went on some amazing vacations, built a house, I finished my Master's Degree, and Steve started his computer business, Henling Tech Consulting. The last 6 years have been amazing and I can't wait to see what the future holds. I am so thankful for Steve and all that he does for our family. He is the best husband and dad ever!